JACKSON, TN – Jeremy Hall tossed seven scoreless innings, and the Biscuits (22-18) collected league-leading shutout number six en route to their third victory in a row, 3-0 over the West Diamond Jaxx (21-19). For the second day in a row, the Biscuits got to one of the Southern League’s top pitchers. On Wednesday it was Birmingham’s Charlie Shirek, on Thursday it was Michael Pineda. In the third inning, Chris De La Cruz and Emeel Salem led off with back-to-back singles. After the runners moved up to second and third on a JJ Furmaniak bunt, Matt Fields tapped an infield single to plate De La Cruz. Matt Sweeney followed with a single of his own to score Salem and make it 2-0. Salem singled home Matulia with two outs in the ninth for the final run. 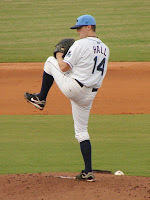 Hall’s (1-2) brilliant outing comes one start after he gave up six runs in one inning to the Barons. He struck out just three Thursday, but walked nobody and scattered seven hits. One season after leading the Florida State League in wins, his first win of 2010 comes in his eighth start. Dane De La Rosa pitched a scoreless eighth, and Matt Gorgen the same in the ninth to get his league-leading eighth save. Pineda fell to 3-1 with the loss, allowing two runs on six hits while striking out eight in his six innings of work. Salem, Matulia, and Nevin Ashley all had two hits to lead the Biscuits. The teams will play a doubleheader on Friday, with LHP Jake McGee tossing in game one for the Biscuits, followed by LHP Darin Downs. The Jaxx will send RHP Luis Munoz and RHP Stephen Hensley. Game one begins at 5:05 CT.